The Human Preservation Project is having yet another round of dead drops for individuals lucky enough to have the day off on Thursday, November 17th. The countdown page is promising that this is the HPP’s biggest expedition yet, so maybe it will be more than first come, first served (but I wouldn’t hold my breath on that). Although the countdown page doesn’t list the “rules” that were given out on previous missions, it probably wouldn’t be a bad idea to follow them in order to maximize your chances at getting one of the last remaining ice flies. • Bring a mobile phone with you that can receive text messages. There’s a coordination thread over at Unfiction where if you want to plan your strategy (or just check out the competition). One of the players of Wonderland or Bust (Take 2) received an email with information about a character meet and/or dead drop taking place this weekend. We will keep the meeting date of December 19th at 1:00 pm Central time at the Minneapolis Central Library. Our meet-up point will be at the statue in the main plaza. If you don’t have agents in Minnesota, I suggest you get some. You won’t like the results if you don’t. I won’t answer calls, but feel free to text me at (612) 568-8442. You’ve got a lot of legwork to do, so find the gamer wearing a Flynn Lives t-shirt. Your contact will be avoiding Sue while wearing a Flynn Lives t-shirt. Your contact is feasting on power pellets, plus wearing a Flynn Lives t-shirt. 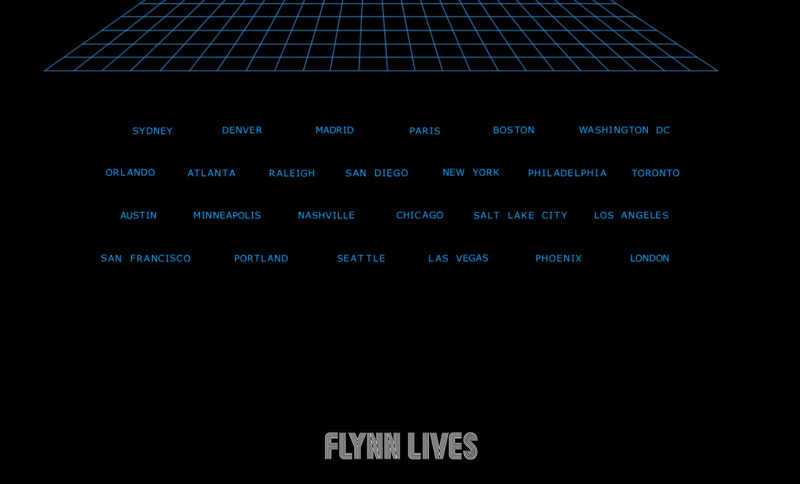 Over on the Flynn Lives website, there is a countdown that will hit zero on February 24th at 11am EST. Below the countdown there is a slowly revealing list of city names. Current speculation is that things will be happening in those cities when the countdown hits zero, but it’s far too early to tell at this point in time. If you live in or near one of those cities, keep the countdown page or back here for updates within the next 5 days. Update: So the image has completely resolved and all of the cities have been revealed. The original list posted was pretty close to what it finished up to be (the two switches were Detroit -> Denver and Indianapolis -> Minneapolis). We still don’t know what is going to be going on in those cities or exactly where things will be happening, but hopefully an update is on its way so those people who are contemplating taking off work will know if they should or not. Okay, here’s the deal. We have two more dead drops based upon the new book tour dates posted at the Farewell Atlantis Facebook page. We know the cities and the dates, but not the actual location. In order to get that, we need at least one person to check out one of the 800+ gas stations during the info drop periods, get the address, and then share it with the group. It should be noted that Soren Ulfert has totally slacked off on alerting us to when the info drops are occurring. By my calculations, there should be an info drop today, but there has been no mention of it. Soren has also changed the time of the drops the last few times so that there is only a morning session (8a – 12p) instead of an afternoon session as well. Of course, since he hasn’t told us anything lately, this could have changed again. But I have to imagine someone somewhere is in a position where they could just swing by one of the locations without it being too far out of their way. Anyone with access to one of the 800+ gas stations can retrieve this information. So, if you live in one of the 15 metro areas listed above, find a gas station near you from the list, swing by today or tomorrow AND Wednesday or Thursday, grab the info and let me know about it. Easiest thing in the world, right? ARG Deaddrop , WordPress - Daydream 2.0 , Entries (RSS) , Comments (RSS).